JuJu is the man. At age sixty-five, he can cook a mean palm oil stew, he can carry on conversations with the parakeets he feeds, and, with a well-timed bit of story-telling, he can draw an excited crowd of neighborhood youngsters. And with twenty years singing in the famous Plataforma samba clubs of Rio de Janeiro plus his years in the street festivals of Bahia, JuJu probably knows more songs than Woody Guthrie. To understand JuJu Duarte’s accomplishment and his gift, you’ve got to delve back into the history of Brazilian music a little bit. Sometime in the ’50s, a kind of split happened in the music known as samba, or even earlier as partido alto. One strand became bossa-nova, art music, music for beach soundtracks, intricate melodies sung with a kind of quiet yearning. The other grew into the samba schools of today, and the lesser known pagode and samba de roda, music for wild parties relying on screaming fast percussion and simpler, more African melodies belted out from the gut. JuJu builds his own innovative bridge between these two broad genres: his powerful singing style can weave in and out of the most intricate bossa-nova or soar out over the most raucous party. Only the most absurd metaphors can approach his voice: picture a bellowing old bull tamed by a young maiden; try an African mockingbird drunk on cachaxa; or Harry Belafonte smuggled into Brazil as an infant. In 2000, producer Beston Barnett was lucky enough to spend three months boarding at the Sao Rafael hostel in Bahia which JuJu opened after his retirement in the house of his birth. The two spent innumerable hours playing together, and struck up a friendship. 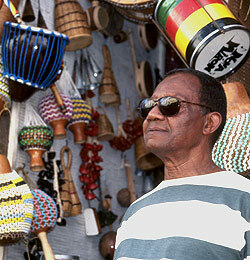 In the winter of 2003 (summer in Brazil), he returned with co-producer Rafi Benjamin and a mess of recording equipment. For two weeks, they sang and played non-stop: the result, Da Rua Dos Ossos (“From the Street of Bones” – this is the actual name of the street Juju lives on), was released by ART HURTS Records in 2006.